Can all citizens vote — and are all votes counted? Vote-counting controversies in both the 2000 and 2004 presidential elections have left a cloud of concern hanging over the upcoming November 2006 congressional vote as well as the not-so-far-off 2008 presidential election. The issues range from the trustworthiness of electronic, touch-screen voting machines to fears that laws requiring more stringent verification of citizens' identities would disenfranchise minority voters. 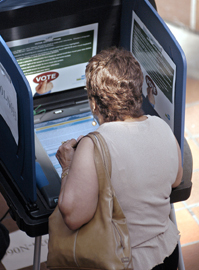 Some computer experts insist that touch-screen machines are vulnerable to hackers and that “paper trails” are needed to ensure that the vote counts can be verified if challenged. But the devices are so popular with election officials that up to 40 percent of voters will use touch-screen machines this year, many of which will not produce backup paper print-outs. Meanwhile, scrutiny of the entire voting process, from voter registration to ballot counting is intensifying in courthouses and statehouses across the country.